Air filtration solutions from Envirox keep your workspace free of the dust, smoke, fume and oil mist particles that pose risks to worker health, machine performance and the environment. We supply a complete range of fixed and mobile air filtration products as the sole distributor of leading European brand Nederman, for single workstations or the whole factory. As your total air filtration solutions partner we offer end-to-end air filtration solutions, including: feasibility studies; planning; system design; installation; commissioning and training. 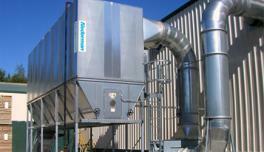 We also install and support air filtration solutions across sub-Saharan Africa! 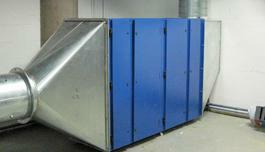 We supply a complete range of dust collectors for a variety of industrial air filtration applications. 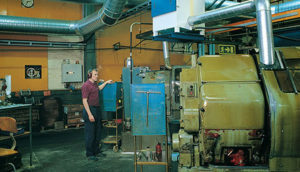 with 24 Nederman dust collectors, we provide solutions for air filtration of general dust; hot gases and high temperature dust; combustible dust; thermal cutting; and welding fume and smoke. We also have a range of hose reels available. Our range of cyclone dust collectors separate large volumes of material from your airstream. They can be used in both indoor and outdoor air filtration applications, and as pre-separators and protective devices. They can be used in wet air filtration applications and the removal of particles up to 300° C.
These dust collectors are ideal in capturing and eliminating welding fumes and dust from your air filtration application in industry and in hygiene-sensitive spaces. These air filtration solutions can be used to remove light to medium quantities of organic solvents, fumes and gas, and welding smoke. Operating machinery releases fine oil droplets into the air. This oil mist needs to be removed from the airstream before it causes health issues and creates oily surfaces that are dangerous to workers. We offer a range of oil mist filters that achieve exceptionally high air filtration efficiencies of up to 99.97% oil mist removal. Equip your work space with leading air filtration systems! Send us an enquiry here. Envirox supplies a complete range of filter bags, as well as filter media and accessories, for your air filtration application. We supply high-quality pulse jet filter bags; reverse air filter bags; and mechanical shaker bags. They offer high air filtration efficiencies for large quantities of industrial dusts, excellent particle retention and efficient dust release. We are a turnkey supplier of bag collectors, ensuring an effective air filtration solution for your facility. Cartridge Filters are more expensive up front than filter bags, but less are needed to achieve the same cfm. Air filtration cartridges offer a reduced air to media ratio and pressure drop, while also reducing the overall size of the collector. They also require less time to replace. Envirox supplies a full range of dust filter cartridges; gas turbine air inlet cartridges; panel filters; and a range of filter media for maximum air filtration efficiency. These industrial extractor fans are ideal in accessing confined, enclosed or temporary areas that can’t be serviced by conventional dust air filtration solutions. We supply conventional air filtration extractor fans, fans for explosive dust and combifab fans in a range of different performance specifications. Design, supply, delivery, installation, commissioning and testing – we provide end-to-end solutions for industrial air filtration! Eliminating dust through air filtration also means your mechanical equipment is safer to use and lasts longer at optimum performance, while workshop surfaces become less slippery and less likely to cause accidents. Laws regulating air quality in work spaces in South Africa and Africa are becoming more stringent. Stay ahead of the game with our air filtration solutions!